I was introduced to Enjoy Life a few years ago when I was on a search for more gluten-free options for Big Brother C, I quickly discovered that not only did my son enjoy their foods, my entire family did! Today, Enjoy Life is a staple in our home, from their Crunchy Cookies to their Mixed Berry Chewy Bars, they are a brand we enjoy & trust. Enjoy Life offers a variety of products that are Non GMO, Certified Gluten Free, contain no dairy, peanuts, tree nuts, egg, soy, fish, casein, potato, sesame, sulfites or shellfish. The foods at Enjoy Life contain nothing but the healthy stuff so you & your entire family can eat freely. I was sent Seed and Fruit Mixes from Enjoy Life, which included two 6oz packages as well as two grab & go packs in Mountain Mambo & Beach Bash. These not nuts! Seed and Fruit Mixes are a low-calorie & low-sodium snack that contains good fats from seeds & antioxidants from fruit. These are perfect for making recipes like the Merry Mambo Munch featured on Enjoy Life's website, or if your like me, you can snack by the handful straight from the bag! The Grab & Go sizes are perfect to toss in my purse or the kids backpacks for snacking on the go! Beach Bash is full of mouth watering sunflower kernels, pineapple, pumpkin seeds cranberries & apricots. My children could not get enough of this mix, they loved the bite size pieces of pineapple & cranberries! The Mountain Mambo contains some of my favorites including sunflower kernels, pumpkin seeds, raisins, apples, chocolate chips & cranberries. Every handful of Mountain Mambo was a burst of sweet & crunchy goodness! Don't they look delicious? Which flavor would you like to try the most? 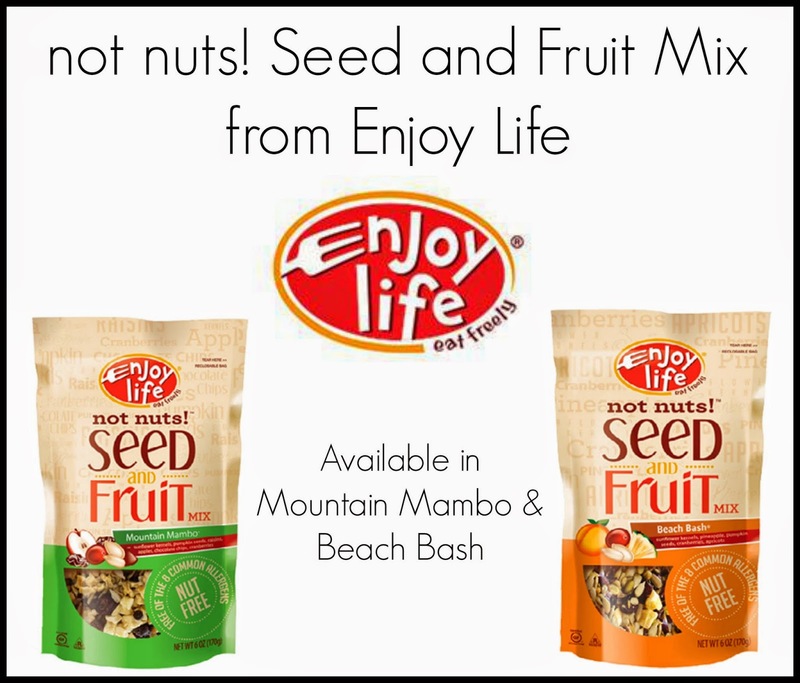 You can purchase both Mountain Mambo & Beach Bash Seed and Fruit Mix online at Enjoy Life! I was also able to track some down at my local Kroger & Super Target! Feel free to stay connected with Enjoy Life on Facebook as well as Twitter! We love the Mountain Mambo mix! Yumm!! I'm hankering for Beach Bash! Your description of these makes me want to drop everything and get some right now! I haven't tried Mountain Mambo yet, but now I'm on a mission!